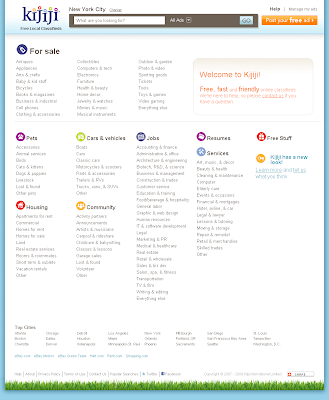 Twitter followers were first to be told that Kijiji.com, ebay's American free classifieds site that competes with Craigslist, has relaunched with a new look and feel. While Craigslist has kept with a cluttered, busy, old-school text-link format, Kijiji.com has taken a turn in the exact opposite direction. The new layout is even radically different from the company's Canadian offering, Kijiji.ca. Gone are the paid-for 'top ads', sidebars and smallish text. The new default view shows ads in day-sorted order with a simple ad format: thumnail picture, headline description, price, location. This will (for better or worse) encourage users to post better photos, write better headlines, set appropriate prices and set their locations properly. I love the color scheme and fonts, and the "grass roots" at the bottom is a nice touch. 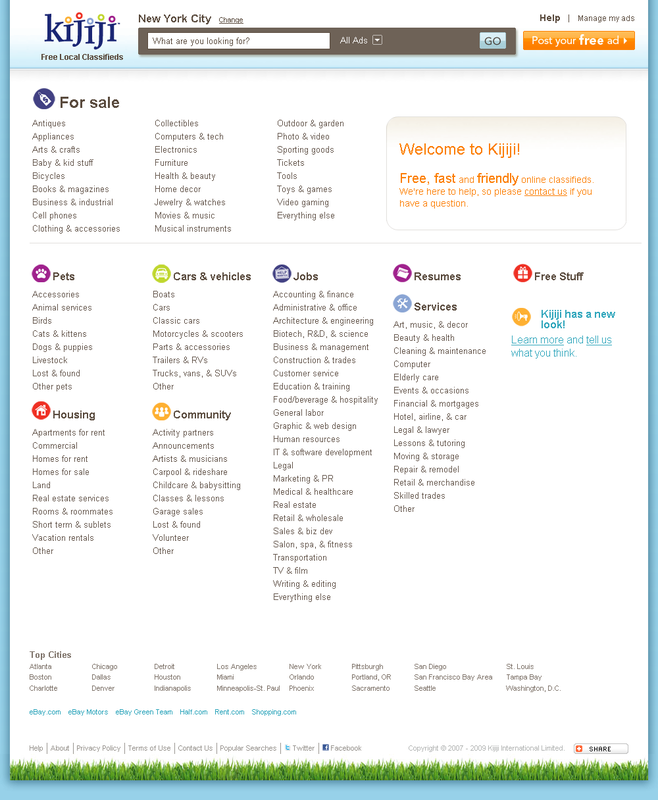 Is a similar change in the works for Kijiji.ca, where Kijiji is more popular than Craigslist in most markets? "We aren't planning on changing our look dramatically here," says Kijiji.ca rep Craig_Kijiji on the Canadian forums. "The US site is independant of Canada." How are Canadian users reacting? "I like it," says forum reader Angus Black. "It also addresses some of the issues when viewing with mobile devices like iPhones. Having this as a mobile device optional view wouldn't be bad." "A lot of features we have here are gone on on their new-look site," notes forum reader ConsoleRepairs. "There is no top ads, homepage gallery ad. I see a lot of people complaining if Canada Kijiji switches over to this very basic layout.I don't even see any search/distance features either." Volunteer forum moderator Nanagoo says the new site is very nice to look at. "Wonder how it would work with the volume of Ads we have? Each page shows 50 Ads. They are in date order with the most recent first." Noting the large space at the bottom for sponsored links, she notes "Lots of room for the sponsored Ads....sigh." What are your thoughts? Is this a Craigslist-killer? Should Kijiji Canada take design lessons from its American cousin? Most importantly -- will this make it tougher to spot the funny ads?! I especially like the thumbnail pop-up preview on the search page. It got so ridiculous that I finally gave up. I guess the seller never got my message. Give me back my good old kijiji.